Electronic Kit School. - In electronic field there are many project with simple and expert circuit to give easily maintenance light dimmer. Using simple or complex component light dimmer can be built. In here we will show you one of the simple light dimmer circuit using triac and diac component that control the lamp or light with rotate potentiomenter. The circuit mentioned look like shown in Figure 1 below. 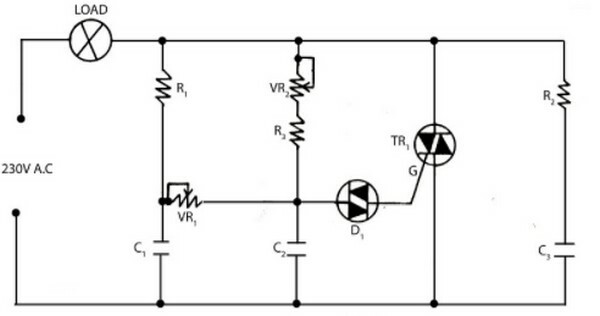 The main component to build this circuit are triac and diac which popular today. In this time, beside we will show you the circuit, here we also will show you component part and global description about this circuit. Circuit like in Figure 1 above show you about the light dimmer circuit using triac and diac. From Electronicsproject site describe that the basic principle of light dimmer is based on phase control. The variable resistor VR2 is main controller of the circuit Light Dimer. From main supply capacitor C2 get charges which trigger DIAC D1. VR1 is used for fine brightness controller which control brightness to lower level. R2 and C3 used to overcome interference problem. As the The lighting source (i.e. bulb, tube light) glow according to their specified watt rating. If we need more light then we have to use high watt bulb at the same place if we need low light we have to replace high watt bulb with low rating. But What if there is not necessary to change i.e. different brightness obtained from same source. Here is the simple but effective project which control brightness according to our use from the unchanged light source.